A pizza that feeds three people for just $7.99? In this economy? 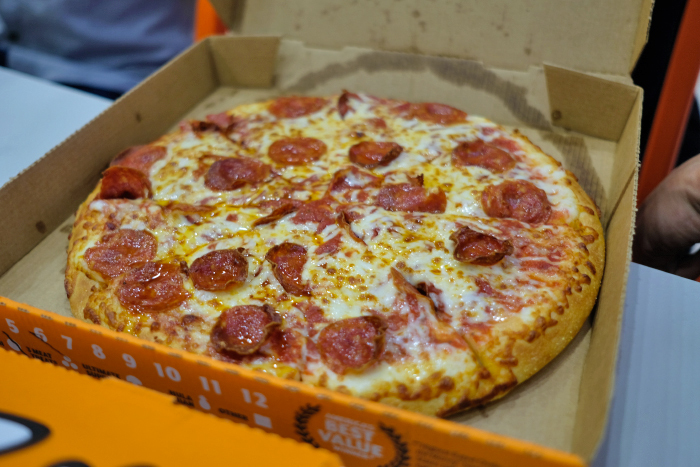 You better believe it, because Little Caesars, the American pizza chain famed for its delicious Hot-N-Ready pies, is coming to paint the city orange. The base of every Little Caesars pizza is simple: a creamy blend of mozzarella and muenster (a semi-soft cow's milk cheese), dough made in-house daily, and sauce from vine-ripened California crushed tomatoes. It's what Mike and Marian Illitch used when they opened their little restaurant in suburban Detroit in 1959, and it's what the pizza chain - now the third largest in the United States with over 4,500 outlets worldwide - use today. For its first foray in Singapore, the pizza party is happening at Income @ Raffles in the heart of the CBD. While the outlet has been in operation since December last year, it seems that they are all set for the official opening on 24 January. And these guys are serious about their pizzas, which are served to customers in as soon as 30 seconds upon order. The menu is kept small and tight, which is really all we want in a pizza parlour like this. Pre-made and pre-heated, Little Caesars' Hot-N-Ready pies come in two options: a 12-inch Pepperoni or Classic Cheese (both $7.99) - which is fantastic value to say the least. Other flavours, which are made-to-order and $13.49 for a 12-inch, include the classic Hula Hawaiian with strips of ham and sliced pineapple; an Ultimate Supreme laden with pepperoni, mushrooms, green peppers, and Italian sausage; and a glorious 3 Meat Treat with Italian sausage, bacon, and pepperoni. Single-serve combos are also available, such as a pepperoni or cheese single-serve pizza and a 16 oz fountain drink for $6, and a $7 combo featuring the Hula Hawaiian or Veggie single-serve pizza with a drink. 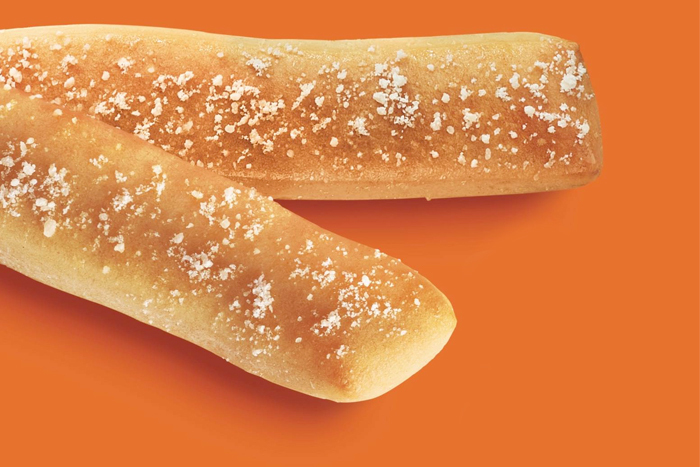 There are breadsticks too, and everyone knows you can't have a successful pizza chain without these crispy guys. Baked with garlic and butter then sprinkled with parmesan cheese, it's only right to eat the Crazy Bread ($2.99 for four) with the accompanying garlic marinara dip aptly called Crazy Sauce. For their opening promotion, you can get two pieces of Crazy Bread on them when you purchase any large pizza. Got plenty of mouths to feed? 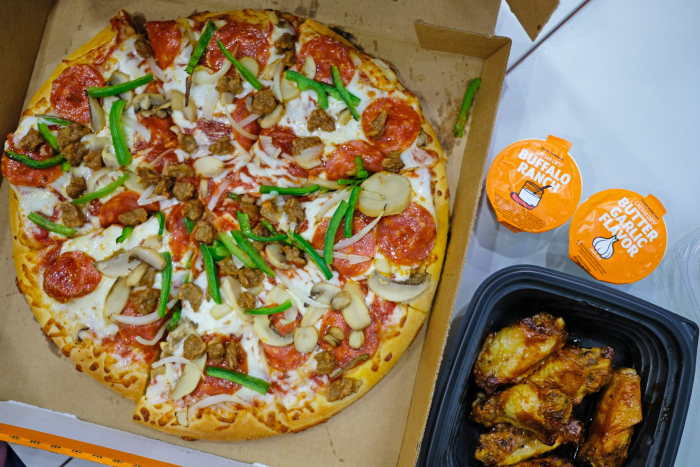 Go for a Family Combo ($35) that comes with two large pepperoni or cheese pizzas, two boxes of juicy wings and breadsticks, and a tall bottle of Pepsi. You're going to have to lug all of that yourself though, as the restaurant does not offer delivery services at the moment. Little Caesars is located at Income @ Raffles, 16 Collyer Quay #01-05, Singapore 049318, p. +65 6260 5272. Open Mon-Fri 11am - 8pm, Sat 11am - 3pm. Closed Sun.